Providers of equipment for rock and materials handling. Specialising in the hire of excavators with hydraulic hammers, dozers and loaders. 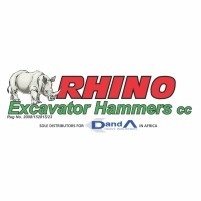 Rhino Excavator Hammers are the agents for D&A hammers, XCentric Rippers, Kangto, Rockwheel and other products in Sub-Saharan Africa. The company offers a range of pulverisers, shears, crushers, compactors, quick couplers and attachments. Sales of hydraulic breakers for rock breaking and demolition work for earthmoving equipment. Rental of earthmoving equipment fitted with hydraulic breakers.